This is a short tribute to one of South Africa’s most colourful characters of World War One and will focus on his military career. During his leave Jack married Nellie Elizabeth Crawford on 22 April 1916. Early May 1916 saw jack recalled to the front once again in command of a battalion, this time the 1st Battalion Royal Inniskilling Fusiliers as part of the 29th Division preparing for the upcoming Battle of the Somme. Leading his Battalion from the front during fighting in the Beaumont Hamel sector Jack was shot through the lung and saved by Jack Johnson until he could be evacuated back to London. During a political rally by Jack in November 1923 a woman came up to Nellie and introduced herself as the mother of Stretcher Bearer Jack Johnson. A meeting was arranged between Jack Kelly and Jack Johnson. In an interview with the Derbyshire Times Jack Kelly said “good deal of handshakes and some tears”. 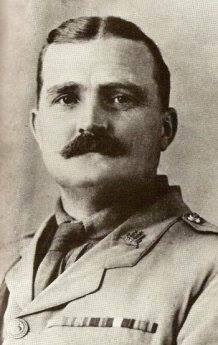 During July 1916 Jack and Nellie embarked on a recruiting tour to South Africa where Jack was received as hero. On his return to England in September 1916 Jack immediately reported for duty. Jack remained in England and on 29 November 1916 received his Distinguish Service Order (DSO) from King George V.
On 01 January 1917 Jack Sherwood Kelly was awarded the Distinguished Order of St Micheal and St George, Third Class or Companion, post nominal CMG. It is awarded for service to the Empire, probably for Jack’s recruiting drive in South Africa during 2016. In February 1917 Jack was again posted to the Royal Inniskilling Fusiliers as Officer Commanding. Early part of 1917 saw a new British offensive in Vimmy and Arras which was followed by offensives in Ypres and Passchendaele. A smaller offensive was planned for November 1917 in the Cambrai sector, using the new weapon “the Mark 1 Tank”. On 20 November 1917, the opening day of the first Battle of Cambrai, 87th Brigade advanced on Marcoing, three miles south-west of Cambrai. 1st Battalion, The Royal Inniskilling Fusiliers, crossed the Canal de St Quentin by the lock east of Marcoing copse. For his gallantry during the crossing of the canal and in leading the attack against the enemy defences on the far side, Acting Lieutenant Colonel J Sherwood-Kelly was awarded the VC. Meanwhile, two companies of 1st Battalion, The Border Regiment, crossed the canal by the railway bridge at Marcoing and one at the lock by the railway station at the north-eastern outskirts of the town. Sergeant C E Spackman was awarded the VC for attacking a machine-gun which threatened this advance. The Germans launched a counter attack which was successfully repelled by the 29th Division during which time Acting Captain A. M. Lascelles, another South African hero, of the 14th Durham Light Infantry was awarded a Victoria Cross. Jack returned to a hospital in London having been gassed again. On 11 January 1918 the London Gazette reported that Jack had been awarded the Victoria Cross which he received from King George on 23 January 1918 at Buckingham Palace. During February 1918 Jack once again returned to South Africa on a recruiting drive. Following a speech in east London in the Eastern Cape Jack was reported and recalled back to England where he was reprimanded and remained with the Norfolk Yeomanry. In August 1918 Jack was put in charge of the troop ship HMS CITY OF KARACHI carrying South African troops. During the trip the Officers revolted sighting his bullying tactics and derogatory statements about South African troops. Jack apologised and narrowly escaped being court martial. Jack served the rest of the war as Officer Commanding the Norfolk Yeomanry. Extract published with the kind permission of The VC and the GC, The Complete History, published by Methuen and The VC and GC Association in 2013.